Billbergia and AMP Capital have submitted a redesign to its previous proposal 111+222. The new DA gives the developers an option to change the use of the secondary 41 level tower from office to hotel, however the original office proposal still stands if the developer is able to secure a pre-commitment for the office component. 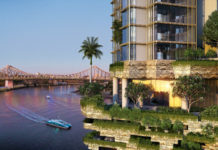 Sources say AMP Capital and Billbergia are now focused on launching the long-planned 90-storey apartment tower later this year in order to capitalise on Brisbane’s booming unit market. 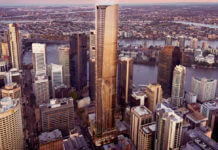 The tower’s height remains unchanged at 274 metres high (90 levels), which will become Australia’s third tallest tower behind Q1 and Eureka Tower. The DA number for this development is A003364851. BCC will let anyone build any plain ugly building. The taller tower is decent enough so long as BCC require that there is sufficient parking and facilities for the residents. That smaller tower leaves much to be desired in the urban landscape of Brisbane. With regard to the shorter building: you do realize that its just a concept / massing model, yeah? I’d say its got a pretty good feel. The ground level shop fronts seem to be recessed for shade/rain-cover and the wavy form adds some dynamic interest to the street frontage. I’m not a fan of arbitrary curves, but this will likely turn out pretty well. What about an observation deck for Brisbane…Overdue!